For Facebook users who recently passed around a status-update game, the answer was pretty clear: friends, family, and health. The analysis was released Tuesday by the Facebook data science team. It examined the aggregated results of a popular status message passed among friends earlier this year. For instance, one status said, “write three things you are thankful for over the next five days” and was tagged with friends who should respond. Think of it as an ice bucket challenge of gratitude. What strikes me in the above map is the subtler ways state residents account for the uniqueness of where they live. Many northeast states are grateful for the beach, or being near it. 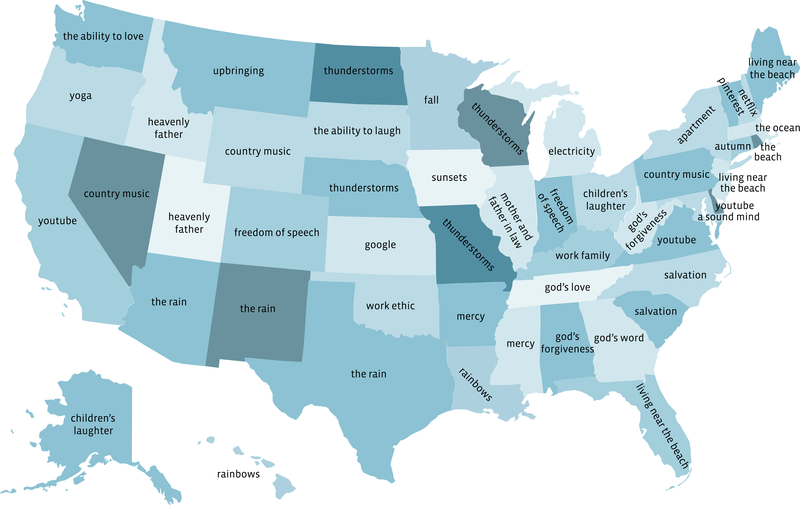 In Wisconsin, “thunderstorms” are the most distinctively popular thing*. Perhaps these are the afternoon thunderstorms which roil through the Midwestern summer day. And Hawaiians and Louisianans—two states that sometimes face tropical storms—are thankful for rainbows. These data dumps—about football and romantic relationships—are always interesting, partly because they reveal what Facebook can glimpse of our lives. While we may be happy to share our gratitude with the public, we should use this as an opportunity to consider what else we are sharing. * This post originally stated “thunderstorms” were the favorite of Minnesota’s. We regret the error.